The earlier Chevrolet Optra had a three piece grille but the newer one has a split grille. The small grille is cut across horizontally by the Chevrolet bowtie. It is flanked by tear drop shaped head lamps. The air dam is a subtle affair having two separate slats for the fog lamps. The wing mirrors are nicely sculpted and have the turn indicators integrated into them. The chunky tyre size of 195/60 R15 is available both in steel as well as alloy form depending on the variant that one selects. The door handles are partly in chrome whereas in part are body colored. This car was designed by Pinnafarina from Italy and does exude an European flavor. Some how the wheel arches are big but then the wheels don’t fill them out completely. 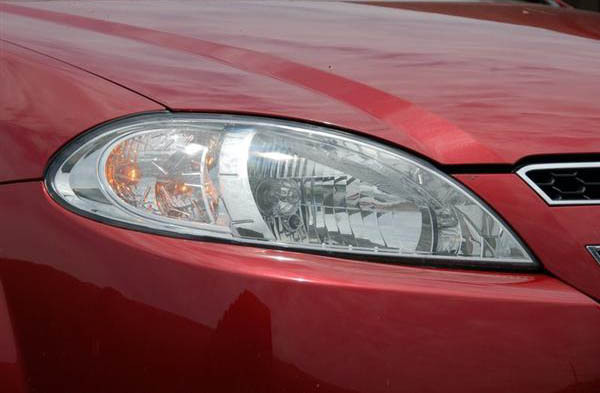 The cheese shaped tail lamps feature clear lens and have the boot opener handle is in chrome. For the top end variant, there is also a chrome license garnish. Oh, lest I forget, the tail lamps are a LED cluster. Simple tail pipe actually spoils the look of this car. Ahh! Welcome change from all those German cars that I have been seeing from the past few days. Everything been so immaculate that we almost are looking out for chances to find fault. Well, the Chevrolet Optra Magnum in India seems to have the same quality as the Germans albeit a bit on the lower side. The interiors are made up of half wood and half leather. Everything out here feels premium to touch. Infact more than the Toyota Corolla Altis. The 4 close spoke steering wheel feel s a tad big to hold but then it has a nice grip. It does misses out on steering mounted controls though. Ample use is made of beige color and the dual tone interiors do look nice. The front seat was a bit low but then higher than the Honda City and so ingress-egress isn’t a problem. 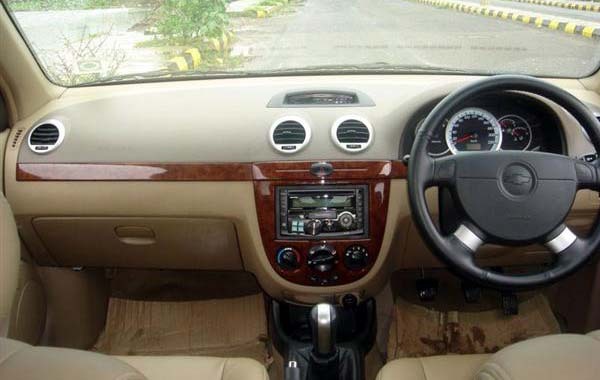 There are many comfort features like the big glove box(this intrudes into the front passenger’s knee space), 2 DIN CD MP3 system, AC vents for even the backseat passengers plus adjustable front seats, auto climate control, rear armrest with cup holder and also the electric sunroof. The back bench is comfy and no problems with it. If there was a problem, it was that the seats are inclined a bit too back and can’t be adjusted. But once you get the hang of things, it is pretty much easy. It is just at some places where you usually don’t touch that some bad plastic bits abound, just like the area under the dash or beneath the seats. The rear seats split 60:40 and this helps in loading long or heavy items in the 460 liter boot. The boot by the way doesn’t have suspension intrusion and so loading it isn’t a chore. 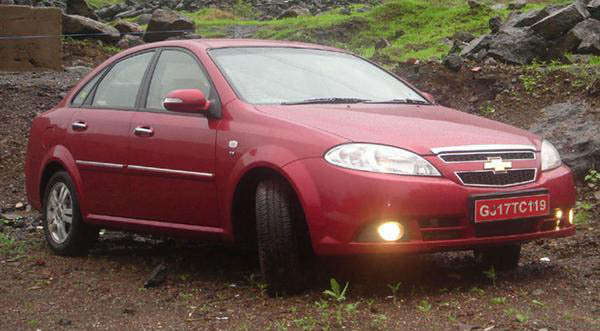 The Chevrolet Optra Magnum in India is offered with Mcpherson Struts with Anti-roll Bar at the front and rear. Ride quality has always been the forte of all the Chevrolets in India and this big Chevy doesn’t disappoint. Its wheelbase of 2600 mm does allow it to absorb the bumps in a better fashion. Low speed ride is excellent with all the bumps been dispatched with a muted thump. But then once the speeds rise, the Optra isn’t able to dispatch off the bumps effectively. It has always been a nemesis of the Indian car manufacturers to get the low and high speed ride quality perfect but as of now, it seems that no one has got it right. The steering wheel is sufficiently light at city speeds and does weigh up somewhat on the highways but not enough to instil confidence. The Optra also seems a bit cumbersome to park and the company should have provided with rear parking sensors. As regards the handling part, the Chevrolet Optra Magnum isn’t a boat but then it isn’t a Bimmer either. It does handle most of the driving chores easily but then chuck it into a corner and the car will be a bit reluctant to do it. It is best left cruising or taking corners sedately. It doesn’t like to be hurried. Another factor demonstrating this is the NVH which is low for a General Motors car. The sound insulation is very good and even at triple digit speeds, there is hardly any engine noise from the petrol or diesel motor. 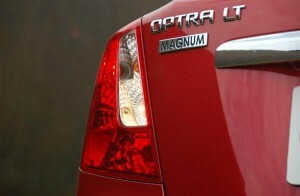 The Chevrolet Optra Magnum in India is offered with two engine options. The petrol engine is the 1.6 liter unit which has 104 Ps of peak power and 148 Nm of torque. This engine is mated to a 5 speed manual transmission. The gearbox though a bit notchy slots precisely into its gate. The DOHC configuration of this engine makes it a silent performer. The petrol engined car races from 0-100 kmph in only 12.3 seconds and its top speed is 164 kmph. The diesel engine was the first diesel by General Motors in India and it is a 2.0 liter TCDi unit which pumps out 121 Ps @ 3000 rpm and has a peak torque of 314 Nm @ 2100 rpm. This engine is actually a diesel rocket and much better than the one in the Skoda Octavia. It races from 0-100 kmph in only 10.2 seconds. The gearbox seems to have been bettered in this one as the 5 speed unit has shorter throws. Even been a diesel, the diesel clatter is inaudible both on the outside as well as inside. The top speed of this car is 174 kmph. Braking on both the cars is achieved via all wheel disc brakes coupled with EBD and ABS. Braking action is smooth and there is no problem in this department. Keyless entry, seat belts with pretensioners, impact proof bumper at low speeds and 2 air bags round off the safety package for the Chevrolet Optra Magnum in India. Fuel efficiency was a problem in the earlier Optras but not anymore. With the introduction of VGIS technology in the petrol, the mileage figures have risen to 11.4 kmpl in the city whereas the highway figure rises to 15.4 kmpl. The diesel on the other hand is a frugal sipper and it returns 11.9 kmpl in the city and 16.1 kmpl on the highway. The Chevrolet Optra Magnum in India is a worthy proposition to all those Germans. General Motors 3 years/1,00,000 km warranty package is also good along with the cashless benefit that one can avail of. The car has space, pace and even fuel efficiency. It has immense road presence as well. The downsides would be the not so enthusiastic handling and the gearbox. Interiors are top notch and hold their value well. The price of Chevrolet Optra Magnum in India for the base petrol variant starts at Rs 7,36,486 and goes upto Rs 8,36,433. In the same vein, the base diesel variant goes for Rs 8,46,416 whereas the top of the line diesel variant is available for as less as Rs 9,36,380. All these prices are ex-show room, Mumbai. How would u compare betn Linia Multijet, Optra Diesel. My running would be 3000-4000 Km a month. Fuel efficiency & lower maintainance cost will be the priority. Both the cars are very good in their own right. Based on your priorities, the Optra diesel (though a bit dated in looks) would suit you the best.